Last week, Paris shooed cars from its downtown for a single photogenic day. Now a neighborhood in Johannesburg, South Africa is one-upping that car-free day with a celebration that kicks cars off the street for the entire month of October. As part of the EcoMobility World Festival, which started today, cars have been banished from Sandton, the central business district of the city and often known as the “richest square mile” in Africa due to its affluent residents. So the changes are actually not just inside that one neighborhood—people obviously have to get there to work. The mayor himself issued a challenge to citizens of the entire city of Johannesburg to try to go car-free for the month as well. To help them, Johannesburg has also adapted some pretty cool mobility solutions to help people get around without their personal vehicles. First is a comprehensive transportation plan that doesn’t really ban cars outright as much as it “prioritizes” pedestrians, bikes, and transit. 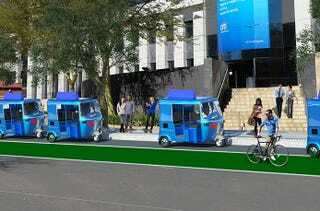 The city’s added temporary dedicated cycling routes and activated a cute fleet of electric tuk-tuks to get people around. Uber is allowed inside the car-free zone but there are also free shuttles making loops throughout the city. So then there’s the other big question—what to do with all those big wide streets? Instead of traffic and parking, cafes and parklets have popped up in the vehicular lanes, with roving street performers and artists filling in the sports normally populated with cars. Like Paris’ car-free day, and the one-day open streets festivals which are becoming weekly or monthly events for most big cities around the world, these kinds of events do lead to permanent changes. In fact, a neighborhood in the South Korean city of Suwon that was the first to declare a car-free zone as part of hosting the EcoMobility festival had some pretty awesome results last year. Speed limits were permanently reduced to 18 mph in some parts of the city after people realized how pleasant life was without cars roaring by. Johannesburg seems committed to using this month-long period not just as a fun festival but also as a time to seriously prototype solutions for keeping at least some cars out of its central business district after the month is over. Legacy projects like a special park-and-ride station outside town to shuttle people around using electric buses will become part of the larger transit infrastructure, with the goal of supplying residents with plenty of options, should they want to leave their cars at home for good.